When a blue supergiant star explodes in a supernova, it can spawn exotic states of matter like quark-gluon plasma, scientists have found. 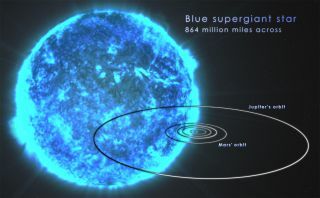 Blue supergiant stars are colossal, growing to up to 1,000 times larger than our sun, as this NASA illustration shows. When the biggest stars in the universe die, they may form exotic states of matter generally not seen in the universe since fractions of a second after the Big Bang. These events may generate enough energy to create catastrophic explosions, a new study finds. A supernova is an explosion that can make a star briefly outshine all the other stars in its galaxy. These outbursts can happen when giant stars that are about 10 times the mass of the sun or more run out of fuel. Their cores then collapse under their own extraordinary weights, so that the objects form either black holes or neutron stars. However, prior research could not explain how supernovas could occur from very massive blue-supergiant stars with masses 50 times that of the sun or more, even though astronomers have detected supernovas from these stars. Current state-of-the-art computer simulations suggested that core collapses of these stars should result in "failed supernovas." In these scenarios, a black hole forms without neutrinos heating the overlying shell enough for it to blast outward in a supernova. Now, researchers suggest that blue supergiants can explode as supernovas, because they can form exotic states of matter created by disintegrating protons and neutrons. The resulting soup of particles has generally not been seen in the universe since an instant after the Big Bang. The nuclei of atoms are made of particles known as nucleons, which include protons and neutrons. Nucleons are, in turn, each made up of trios of particles known as quarks, which are glued together within protons and neutrons by particles known as gluons. Under extreme pressures and temperatures, nucleons can break down, forming an exotic state of matter known as a quark-gluon plasma. The researchers suggested that this process of disintegration, called quark deconfinement, could generate "a large amount of heat," resulting in a supernova, study lead author Tobias Fischer, at the University of Wrocław in Poland, told Space.com. The scientists used computer simulations to model the evolution of a supernova from a blue supergiant 50 times the mass of the sun. They found that quark deconfinement could explain a wide variety of supernovas. They also found that after supernovas occur from blue supergiants, the remnants of those stars form "hybrid stars" — neutron stars about twice the mass of the sun, with cores made of soups of free quarks. One way to see if quark deconfinement actually does happen within dying blue supergiants involves neutrinos. The collapse of a star's core generates a neutrino burst, but the scientists calculated that the breakdown of nucleons into a soup of quarks should generate a shock wave that would, in turn, release a second neutrino burst. Future research could analyze supernovas of blue supergiants for pairs of neutrino bursts to help confirm this model and reveal details about the still-mysterious formation of quark-gluon plasmas, the researchers noted. Another way to see if such quark deconfinement happens is to look for the resulting hybrid stars. Although these stars would greatly resemble neutron stars, they should cool and spin in significantly different ways from neutron stars over time, study co-author Thomas Klähn, an astrophysicist at California State University, Long Beach, told Space.com. The scientists detailed their findings online Oct. 22 in the journal Nature Astronomy.